For landing gear to function efficiently, several components must work in a certain sequence to avoid any interfering issues or collisions. 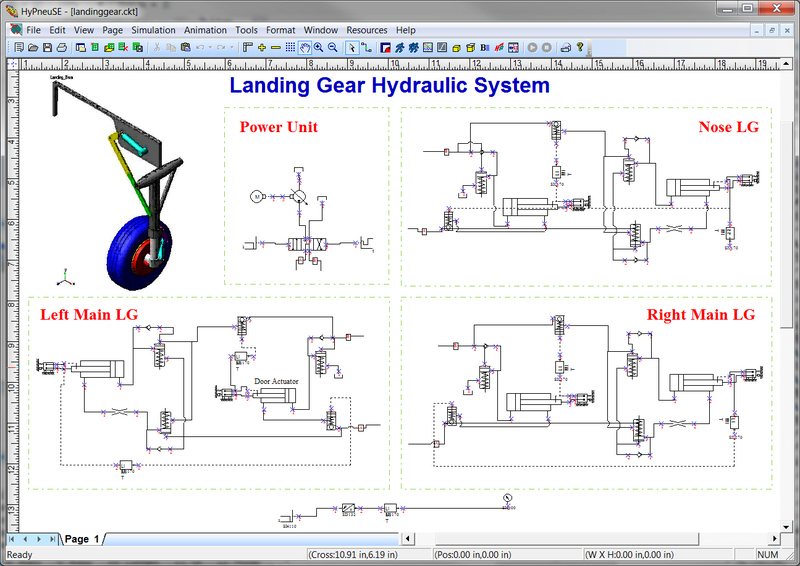 HyPneu can be used to create hydraulic circuits and logic circuits to control the extension and retraction of the landing gear as well as the opening and closing of the doors. The dynamics and logic of this operation can be simulated along with landing impact force dynamics and operation stability. An example circuit is shown here for simulating the function of the landing gear on the wings and the landing gear at the nose of the plane. All aircraft require hydraulic systems for flight control systems. Flaps, ailerons, rudders, and elevators experience large forces from airflow and require hydraulics to operate. HyPneu’s simulations incorporate all parameters of a hydraulic system so the end result will be a simulation that represents the true flight dynamics of the aircraft’s flight controls. 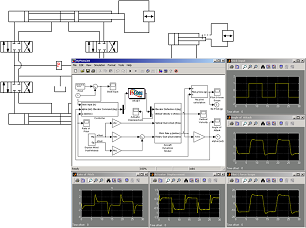 These HyPneu simulations can integrate seamlessly into CAE packages such as Simulink. Using HyPneu, simulation accounts for and represents the continually changing dynamics of the flight controls, instead of a simple transfer function linear model—a serious advantage. HyPneu can be used to determine the proper valves and controls needed to optimize fuel delivery. HyPneu can use a control algorithm such as P, PI, PID, or a user’s proprietary algorithm to simulate the fuel delivery dynamics. Our example shows a sample fuel control circuit that could be used to determine the proper valve for optimized fuel control. 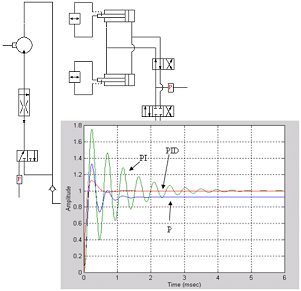 The results show that a PID control would be the best option for this circuit. The PID control provides the smoothest fuel delivery with minimal fluctuations.